The following statement has been issued by the New Zealand Defence Force on behalf of Major Craig Wilson, the officer commanding Kiwi Company at the time of the gun battle with insurgents in Bamyan, Afghanistan, on 4 August. “I am writing this statement for release to the general public. Until I am well enough, these words will have to take the place of me speaking directly. “All six of us wounded personnel are incredibly pleased at the way LCpls Pralli Durrer and Rory Malone were honoured by their Army units and the nation more generally over the weekend. We are thinking of Rory and Pralli and it gave us great comfort to see them appropriately honoured. “Our first thoughts are with the families of Pralli and Rory and I look forward to meeting the families in person on my return to New Zealand. I appreciate the support being provided to the families of our fallen, which I know will be coming from so many compassionate people in the country we serve and love. “We are very much thinking of the Durrer and Malone families and their friends, as well as the families of all the guys still out doing the job in Afghanistan. We really appreciate the support of the New Zealand public, and I am hopeful that that public support will be ongoing to the families of the men and women still delivering the mission in Afghanistan. “With regard to the other injured men of Kiwi Company, I have been very proud of their conduct. We have tried to be as strong as possible. I am sure I speak for us all when I talk about the support we have received. “This initially came from our mates on the ground, who in some cases risked their own lives to get us out of immediate danger and provided immediate first aid. Then from our medics – who have been consummate professionals all tour and stood up yet again. “Finally, from our headquarters and support personnel who brought all the external support to bear that we needed; who made the best of what was an incredibly difficult situation; and, as always, made the troops on the ground feel supported. “I would like to also publicly praise the coalition troops who responded in support of the situation – especially the MEDEVAC helicopter pilots and crews who are some of the most skilled and brave unsung heroes of the Afghan theatre. “Thanks also goes to the many coalition medical teams through the chain of evacuation that in some cases saved our lives. In all cases they made us feel safe and secure. The public of New Zealand should know that these Dutch, German and American medical teams treated us like their own countrymen, working tirelessly and with great skill. “I would like to thank our military leaders and their staff back in New Zealand, who through their hard-working liaison officers have made us feel as though heaven and earth is being moved to keep us supported, and getting us home to our families quickly, where we all want to be. We look forward to reuniting with our family and friends, getting our medical treatment finalised, and getting back on with things just as soon as we can. “With regard to the incident itself, I and the other wounded look forward to formally passing to the New Zealand Defence Force, at the appropriate time on our return, the knowledge and detail of this battle that we possess. This battle was very fast, very complex, and came down to a pitched gunfight where the insurgent force had many advantages over us at that moment. The full story is yet to be pieced together. “Judging by the nature of my wounds, my days as an operational soldier are probably over but I will continue working for my soldiers now and over the next while to ensure that they are accredited the respect and recognition that their actions in Bamyan deserve. “While this was a major combat engagement, it is what our men and women work and train for. I know Kiwi Company will have continued on committed to their work in Afghanistan because they are a professional group, and that’s what soldiers do. On 4 August, Kiwi Company came to the support of the Afghan National Directorate of Security who were under attack by insurgents. The NDS sustained two deaths and a further 11 personnel, including one civilian, were wounded. The New Zealand Defence Force sustained two deaths and a further six wounded. Major Craig Wilson was shot in the shoulder and received multiple wounds to his lungs, ribs, collarbone and shoulder-bone, as well as artery and tissue damage, and has lost the use of his right arm. However, doctors anticipate that he will regain some if not all function after likely many months rehabilitation. All of Maj Wilson’s wounds have been effectively treated, except the nerve damage where treatment/rehabilitation will commence after his return to New Zealand. Maj Wilson is a married father of three, who lives in Burnham. In 2007, he received the New Zealand Gallantry Decoration – NZGD – for events while serving with the New Zealand SAS in Afghanistan in 2004. 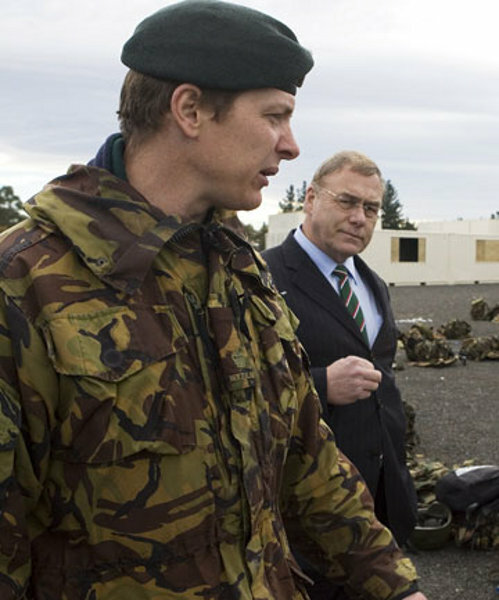 The NZGD is the third-highest military decoration for New Zealand. It is granted in recognition of ‘acts of exceptional gallantry in situations of danger’ while involved in war and warlike operational service. This entry was posted in Lest We Forget, The Thursday/Friday War and tagged Afghanistan, Command and Leadership, New Zealand by SJPONeill. Bookmark the permalink.